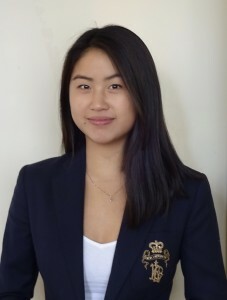 This week’s blog post is written by second-year Bachelor of Commerce student Madeleine Fontein. We all know that being a university student can be challenging at times. Sometimes you are so busy and the last thing you want to be worrying about is where and what you will be eating that day. Food is a necessity… it should be easy. 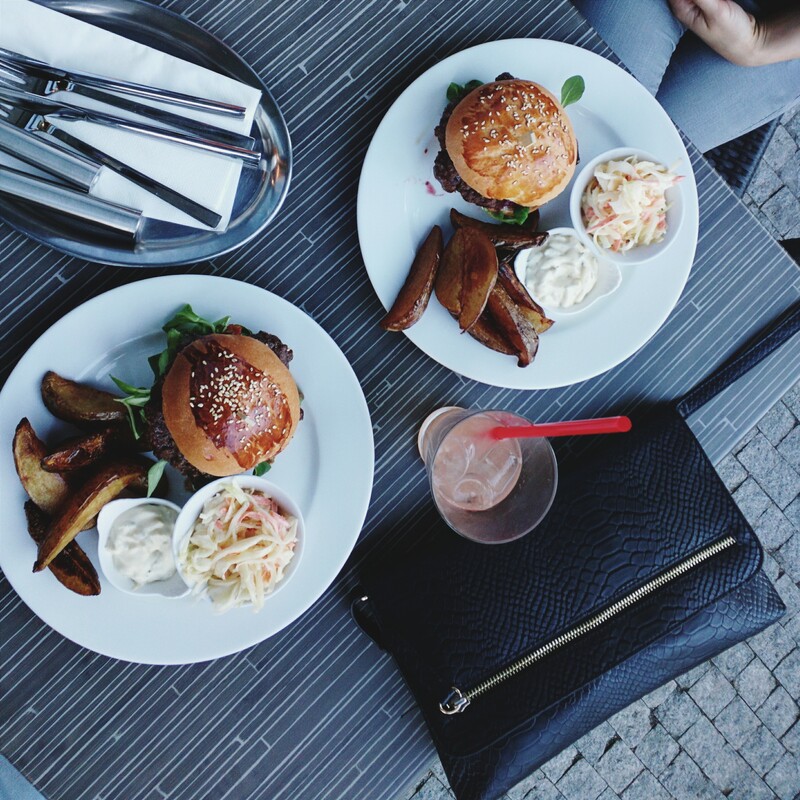 U eat is an app that was developed to improve university student’s dining experiences. When I was talking with the apps developer, Spencer Fontein , he said this issue is exactly what gave him the idea to create the app, “I came up with the idea when I was with my friends trying to decide what dining hall to go to for dinner. We said, wouldn’t it be great if we knew what was being served”. It started as a basic provider of weekly menu items, hours of operation and locations of other food services. It has grown to provide even more information about food services around campus, and if it was available at Dalhousie, I know I would use it every day. As business students we are very busy. U eat can help you plan your meals and be more efficient in the dining hall. You can look up to a week in advance and see what each dining hall will be serving. If you never want to miss your favourite meal, you can add it to your favourites list and get a notification when that meal is being served. “U eat also identifies common allergens and whether items are gluten free, vegetarian or vegan”. For health conscious students it also provides detailed nutritional information about any item being served. Keeping track of your expenses is another thing that is always on our mind as university students. U eat makes it easy to track your meal swipes and dining dollars. It also shows you the most popular off campus restaurants that offer great student discounts. “So if your favourite item isn’t being served on campus you know where to go to get a bite off campus”. The most unfortunate part about the app is that it is not available at Dalhousie. Dalhousie Food Services does provide their menus on the website. However, it is not as accurate and convenient as U eat. But the app is being updated regularly to include new colleges and universities. I suggested to the developer that it would be a good idea to add a social component so students could let their friends know where and when they were going to eat… nobody likes to eat alone! Go to the App Store and Download U Eat if you are at one of the many schools it is available at, and hopefully it will be available at Dalhousie in the near future. 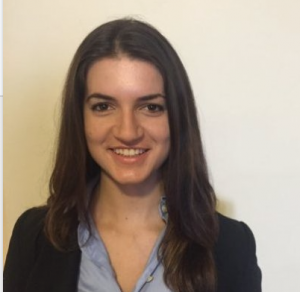 This week’s blog post is written by second-year Bachelor of Commerce student Samantha Rudy. As a Finance student who strives to stay up-to-date with stocks and business news (usually between classes), I know how essential it is to find an app that offers this information in a timely fashion. Keeping up with business news is fundamental for any business student’s success. If you want older generations (a.k.a. your future employers) to believe that your generation follows news other than Kim Kardashian’s latest engagement, prove your worth with your most powerful tool: knowledge. If you’re like most university students, you have a tight budget. Why pay for Stock Watch, Stocks Live, Stock Pro or Portfolio Live when you can get the Bloomberg app that gives you stock updates with zero cost. As students, we tend to agree that everything is better when it’s free. Ratings are available through the link below. They were placed on a 6-point scale for the purposes of comparison. It ranks 8% higher than CNBC, the runner-up. Let’s explore the importance of these categories to business students. Let’s face it: millenials have a bad reputation in the business world. We’re stereotyped as lacking work ethic, being apathetic and over confident without substance. What better way to disprove these damaging stereotypes than to illustrate your extensive knowledge on business news? The Bloomberg app ranks highest in this category compared with its competitors. The Bloomberg app allows you to create an updatable “watchlist” that allows you to track preselected stocks to watch the market change live. The app also gives you the ability to see these stocks in a snapshot to compare them. To minimize your risk as an active trader, developing better option investment strategies is crucial. Compared with its direct competitors, Bloomberg ranks in the top two for its value to active traders. To meet your future portfolio objectives and become a smart investor, start understanding the impact that macroeconomic and microeconomic indicators have on stocks. Time is precious for every university student. Bloomberg’s stock summaries make the app easy to follow. It provides a snapshot that allows users to see all of the information necessary for an investment decision without having to spend time searching through various features on the app. Bloomberg offers quality, efficiency and cost effectiveness. If you’re a business student looking to gain business knowledge to land a great job (or you at least want to look like you have that knowledge in an interview), download the Bloomberg app right now! This week’s blog post is written by second-year Bachelor of Commerce student Tighe Loch. Emaze is the newest online presentation platform that functions on all computers without installing any software. It takes the fundamentals of PowerPoint and 3D/modern aspects of Prezi, and combines them into one user-friendly package. Instead of having to use two or three different presentation platforms, you can rely on just Emaze. Did you know that over 30 million presentations are delivered every single day? Now, think about all the presentations you’ve ever experienced. Boring and “Why am I here?” must have come to your mind. All the old templates and graphics leave you wanting something new, something exciting. Engage your audience. Make them want to pay attention to what you have to say with an alternative presentation platform like Emaze. 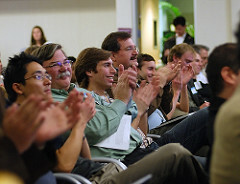 You have the ability to make creative, modern presentations that are professional and informing. As business students, you can take advantage of Emaze and really catch your peers and professors’ attention and be the stand out on your semester project (get the A!). It will be a breath of fresh air for everyone involved when you put up your presentation. Who’s not excited to see something so different? Emaze does have a free account option and an education plan for students that is about $35 per year. 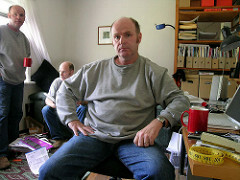 I created a free account and found it useful and easy to navigate. It contains some great options for graphics and different eye-catching details to entertain your audience. With templates placed into categories and their preset color and font schemes you just have to focus on the content. This is perfect for your busy Commerce schedule. All you have to do is pick a template, place your content and ta-da! You have a finished project that looks appealing and gets your message across. Since Emaze is an online platform, you can access your presentation from anywhere with Wi-Fi, which now-a-days isn’t hard to find. This is great for students because you can take your presentation with you from smart phones to tablets and laptops. This is super useful because you don’t have to keep emailing yourself the newest version. You can simply login to your account and there it is. I know it won’t be for everyone, but it is definitely a good resource to take advantage of. Engage and emaze your audience when you step up to present. No one wants to think “someone was sleeping during my presentation”. Your peers will ask you how you created such an appealing presentation. Try Emaze. Susan Adams’ in her article, 8 Keys to Better Business Writing (Forbes, Jan 18, 2013) discusses the use of business jargon in modern business writing as she reviews the Harvard Business Review Press book, HBR Guide to Better Business Writing by Bryan A. Garner. Adams cites the following paragraph from the book. Using this paragraph as an example, Adams, explains why the usage of common business jargon is clichéd. Words or phrases that are classified as clichéd, indicate extensive overuse to the point of being ineffective. Phrases like “on-boarding”, “drinking from the fire hose”, “water cooler talk”, “get-give”, “dashboarding”, are some others that are also commonly used. 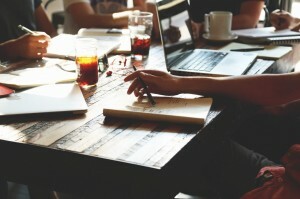 Larry Rudwick, a Business Coach at Business Tune-Ups, has created a website to help businesses make a positive change and lists some commonly used business jargon phrases, business slang and other related terminology used by people as analogies to something else. Rudwick lists phrases such as “10,000 Foot View” – a big picture view of things, “Bang for the buck” – a good and often immediate return on investment, “Shotgun Approach” – a broad approach, “Due Diligence” – adopting a proper investigative path to problem solving, “Learning Curve” – the time it takes to learn a new skill or technique and “Sweat Equity” – work that is compensated by a share in the company, particularly with startup companies. Rduwick cautions that everyone use these words or phrases carefully. Mallet, Nelson and Steiner (Forbes, Jan 26, 2012) also compile a list of “The Most Annoying, Pretentious and Useless Business Jargon”. They list “Core Competency” – a firm’s or individual’s fundamental strength, “Buy-In” – trying to convince someone about a particular course of action, “S.W.A.T. Team” – a team of experts assembled to solve a business problem, “Boil the Ocean” – to waste time and even “Corporate Values” as examples of such annoying business jargon. The last one, “Corporate Values” is interesting, because it assumes that the corporation, an entity that consists of individuals, has the values, and not the individuals themselves. But before we dismiss these phrases completely, let us explore for a bit why such phrases have fallen out of favour. People have always used analogies or metaphors to convey their thoughts and actions. In the business environment, where time is often scarce, an attempt is made by business professionals to convey a sense of urgency or importance to an event or action. Sports is often used as a ready source of such phrases because there is a lot of action in sports and athletes are rated by their performance. Athletes work hard and strive for success in their respective sports and business leaders seek to emulate such performance, and to inspire their employees to work hard and strive for similar successes in the business arena. But when such phrases get adopted widely and are used merely for effect, rather than actually meaning something, the phrases tend to lose their effectiveness. The person saying them does not appear genuine, and the people listening to such phrases do not really believe in them. Many of these phrases are typical to a particular region of the English-speaking world. Most, if not all of them, can be found in North American business-speak (the spoken business language). However, in places like United Kingdom, Australia, South and South East Asia, parts of Africa and South America, these phrases and others could be adapted to the local customs and practices and have a heavy dose of local or regional cultural references. The problem then is that outsiders, not aware of local cultural references, will find it difficult to understand these words and phrases and that creates a definite communication barrier. The lesson to be learned from these communication episodes is that it is best to keep things simple and clear. A clearly phrased question will always allow the receiver to give a clearly phrased response, free of slang, jargon or other words. The communication is effective and work can take place with minimum interruption. Kapish!! Now let’s head full tilt towards giving our maximum as we crest the wave. Write in and let everyone know about any such business jargon that you have come across and what it means. Yes, it’s that time of the year when shopping isles are peppered with young people looking glassy eyed at shiny items and parents are digging deep into their bank accounts. Hints of it are everywhere. What’s that big display in the store entrance…red bells and white flakes? 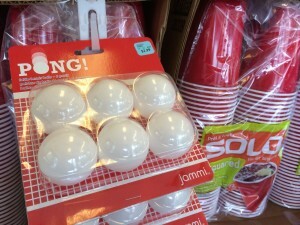 No…wait…upon a closer look it’s white “Pong!” balls and red plastic beer cups because not only are these stores student-friendly, they are drinking-student-friendly! What’s more, dear students, if you can’t figure out how to drink enough on your own, the display helpfully pairs together the tools for drinking games to maximize intoxication. Conveniently, the NSLC (Nova Scotia Liquor Commission) is located a few doors down in the same building, and all within walking distance of thousands of university students. A very thoughtful bunch. 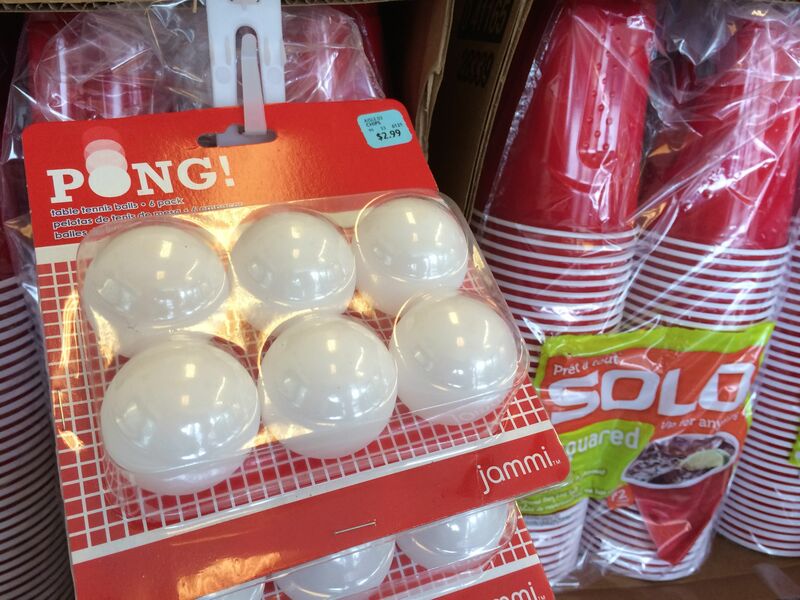 The message here is simple: you like beer and pong, we like beer and pong; let’s be friends. And now that we are friends, come on in and visit. Inside, the isles are packed with things to help you through the term and signs to help pick the best buys–clearly marked red “Sale” flags. SO helpful. 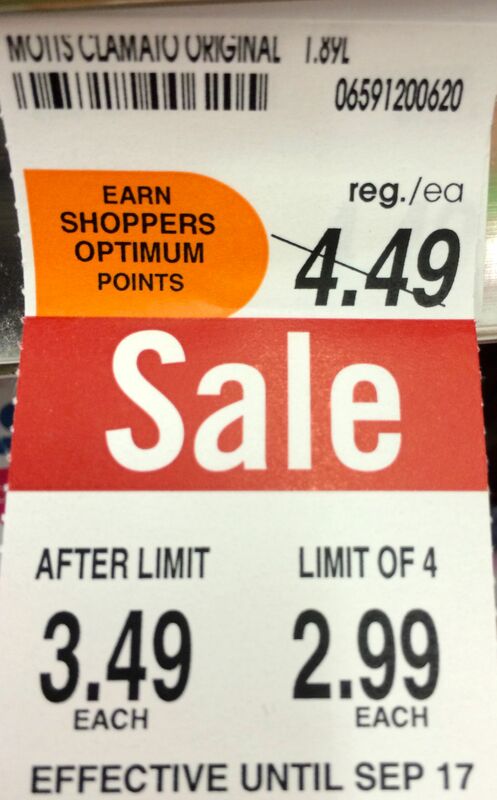 However, as helpful as the red tags are, if not scrutinized carefully, the bargain could be a bust. If you thought “close reading” was only for English lit, think again: figuring out the real message of the sale signs often poses challenges in both math and language. Here are some I looked at last weekend. 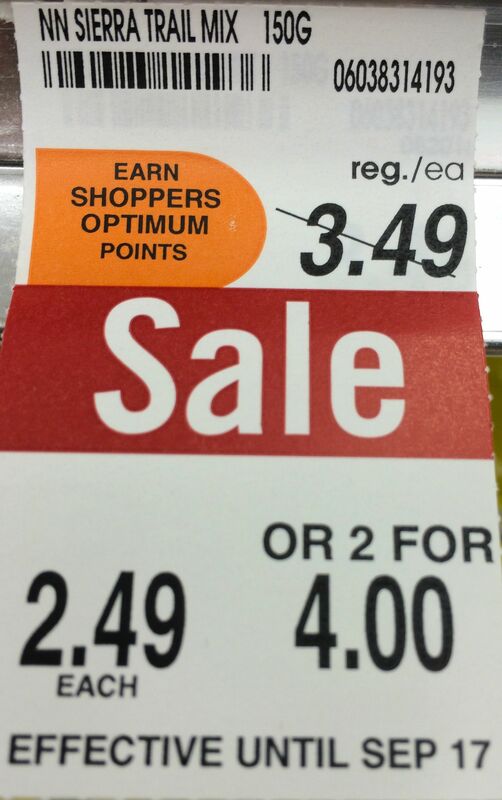 I noticed three basic types of sale stickers, reminiscent of sentence types (though that fascinating topic can be covered another time). The types are 1) Simple, 2) Compound, and 3) Complex. Type 1: Simple Some sales are easy–you get a dollar off if you buy one, you get a dollar off if you buy 7. Prime and divisible numbers welcome. Just buy it. Type 2: Compound Other sales show different prices if you buy the item in pairs or singles (hey, is this moving to discrimination territory?!). 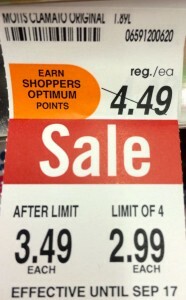 If you get five, the overall discount per item requires math, but if you get six, no calculator required. 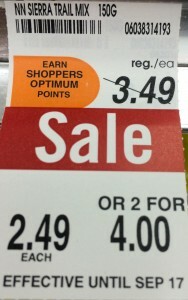 Then, if you buy two (to get the best discount) and only use one, was it really a good buy anyway? Type 3: Complex Beware! Here the best buy is in smaller batches rather than large ones. 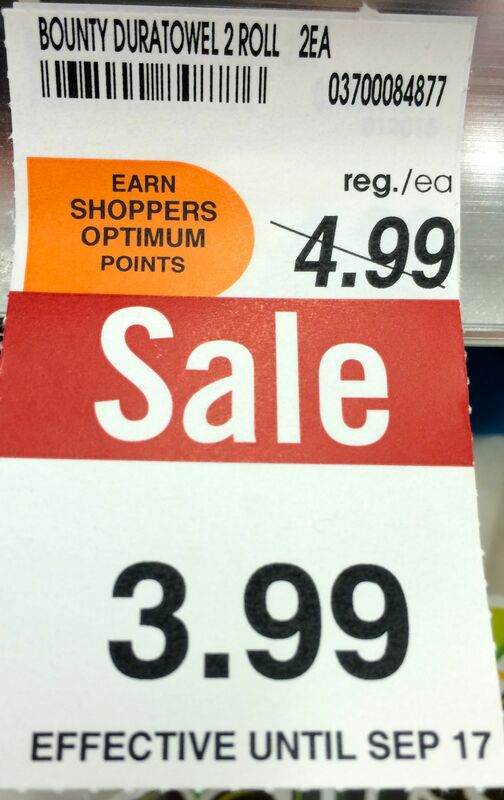 So if you’ve been going along looking at the sale tags without reading closely, and you fill your cart up with this item, you are not getting the best discount. My message is simple: sometimes red packages are red flags. Nothing demonstrates a lack of credibility and insight like a poorly designed, oversized graphic in a report. It’s like a giant billboard for FAIL. 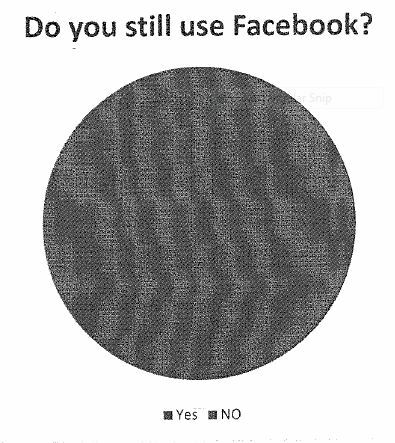 In this post, I present some of my favorite pie chart blunders. Pie charts were selected on the ability to provoke both hysterical laughter at the absurdity of the image and uncontrollable tears at the evidence that class time has been fruitless. These graphics have, of course, been rendered anonymous to protect the reputation of the business leaders of tomorrow. Seriously? And was this information even worthy of a graphic? Graphics should make it easier to understand the information. Even if clearly distinguished colours had been used, this information, as simple as it is, might have been better expressed in the text. What does this tell me?! What does it mean? If there is no title, I don’t know what the figure shows me. Percentages of what? Eighty what? I’m so confused! This student is using a secondary source to argue that the use of Groupon can have a “massive” effect on a business’ bottom line. But to prove this statement, the student writer has distorted the facts. 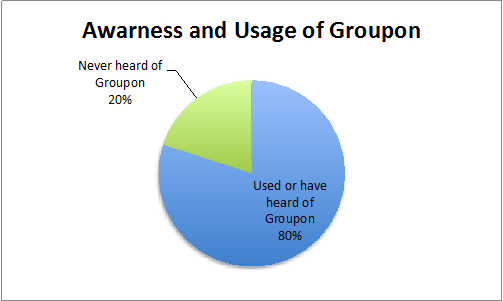 The source, an article in YPulse on Millenials and couponing, actually states that 32% of students have used Groupon and 48% are aware of the site but have never used it. The student manipulates the data and combines two figures to get 80%. In addition to distorting the facts, the student omitted the date in the in-text citation and reference list. The date is clearly included below the title in the original source. Was this omission to make the data appear more current than it is? Because the data is manipulated, I am very suspicious of the writer’s credibility. His credibility was first compromised with the misspelling of “awareness”. With all these blunders, I don’t believe a word he says in the rest of the report. I could show you other badly designed, unreferenced, or misleading figures, but since I don’t know where a lot of the information came from, thanks to students’ poor use of secondary material, I can’t share them with you. I also have to spare you the cut-and-pastes that are distorted, blurry, widened, or elongated and display nothing more than a lack of original content. Nor will I include figures shrunk so small that the text is unreadable. Questions or suggestions about creating effective tables and figures? Please leave a comment! If you would like to be appalled by more bad graphics, see C.J. Schwarz’s “A short tour of bad graphs”. 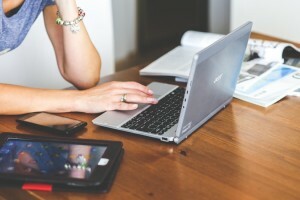 Business Communication: Rapid Evolution or Trapped in Old School? Snapseed and Wordswag create images and font styles for social media posts. LinkedIn and EFactor establish online networks. Prezi and Keynote offer design templates for slide shows. Business to customer relationships are developed through Facebook, Instagram, and Pinterest. Effective business communicators use these new and modern forms to establish and maintain relationships with partners, competitors, and consumers. But despite the technology that accelerates the speed of delivery and alters the forms of business communication, modern North American business writing continues to rely on principles that have defined effective business communication for centuries. To be an effective communicator, you will need to master both modern swag and old school charm. Fortunately, both new and old share some general principles. Although we might object to the inflated language and overuse of commas in the Chesterfield excerpt, the message on the importance of clarity and conciseness is the same today. Modern communication forms like the 140-character twitter posts and instant messages illustrate the continuing preference for clear and direct messages. Business writing should focus on developing and maintaining relationships. Business is about relationships—between stakeholders and business, between partners and competitors, and between businesses and consumers. Maintaining these relationships is key to your success. 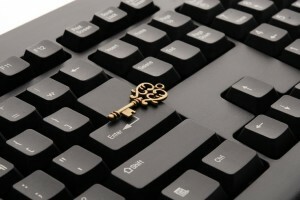 Every message within, from, and to a business influences the relationships. In a 2012 post, Lynn Gaertner-Johnston described the frustration she felt after receiving a 43-page email outlining the terms and conditions of a rental car agreement. Gaertner-Johnston complained to National Car Rental that she didn’t have time to read all that. The company quickly offered an apology for the inconvenience and a summary of the main changes in the agreement. National’s emailed response, personalized in both the greeting and the salutation, appeared sincere. The response demonstrated a desire to continue the relationship, a relationship Gaertner-Johnston was then happy to continue. Professionalism matters. Business communications today range from the highly formal cover letter and résumé and long reports to the conversational blog post and instant message. But informality does not license inattention or incompetence. Manipulating language and tone along the full spectrum from highly formal to conversational requires strategy. Your use of language reflects your developing executive presence. The casual misuse of capitals, commas, and contractions has an effect on the way others perceive you. Attention to tone and style are especially important when you are a young because you haven’t yet developed the gravitas that comes with age and experience. I have numerous examples of emails to me as a professor that illustrate the effect lackadaisical and inappropriately casual language can have, but I will share just one. Yes, please do use me as a reference. I’ll have plenty to say. The forms of business communication are evolving, but no matter how casual the form, business communication should be clear, should focus on the relationship with the audience, and should be strategically crafted. If you find lapses in the business world in these three principles, I’d love to hear about them.